eliminate the effect of alcohol in real time! Sober.Me is all natural. The active ingredients in Sober.Me are listed on the FDA’s GRAS (Generally Recognized As Safe) list and have been demonstrated to be effective. 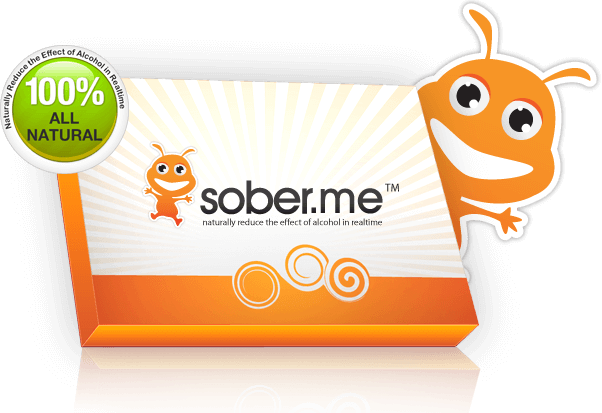 Sober.Me helps your body cope with the alcohol you consume. Your body can only do so much. Sober.Me picks up where your body leaves off. Taking Sober.Me with your first drink and drinking responsibly throughout the night will reduce or eliminate the effects of alcohol. Sober.Me is not to be abused by binge drinking. Do not drink and drive. Sober.Me is not meant to immediately alleviate and obviate the effects of alcohol.